Myths, Misinformation & Misleading Stuff - Enlightened Solutions Ltd. - Paleo Nutrition - Designed By Nature. Sometimes we are given incorrect information by people who are sincerely trying to help, but may themselves have been given incorrect information. This can be anyone; from a trusted professional to the neighbour's dog groomer. Sometimes we are outright lied to in an attempt to sell us a product or to cover up a problem. Sometimes we are given misinformation (incorrect or inaccurate information) or disinformation (information intended to deceive) to mislead, to cover up, to sell or to convince. Unfortunately, thanks to the internet, misinformation seems to spread faster than a rash. Check back often. 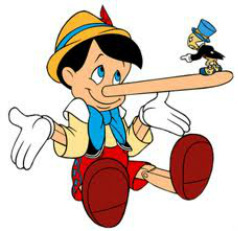 I suspect that this page will grow as fast as Pinocchio's nose. A Paleo diet is neither high in protein (meats) nor low in carbs as some people presume. A well constructed Paleo diet is based on traditional foods and includes meat, fish, seafood and eggs as tolerated. But, the largest component of the diet will come from leafy green and colourful vegetables as well as fruit and some starchy vegetables. Unfortunately, there have been poorly researched articles printed which make it look as though a Paleo diet is almost all meat. Nothing could be further from the truth. OK... just to confuse you, the above statement is absolutely correct. I wanted to include this here, as this is a popular "straw man argument"* that uninformed internet trolls like to hold up and then shoot down. The fact is, pretty much anyone should be able to figure out that humans evolved all over the world, and that different parts of the world have different flora and faunae that would have been available for humans to eat. Someone who lived near the Arctic Circle 10,000 years ago would not likely have eaten pineapples or coconuts. Conversely, someone living near the equator probably didn't eat a lot of seal ribs or oolichan grease. Don't forget about animal and bird migration, of the seasonality of plants. So, no... there is not one single Paleo or ancestral diet. Rather, this is a template. Try to eat unprocessed, whole foods that do not come with a nutritional information label. Even better, try to eat what is seasonally available in your local area. Now, you're eating Paleo! Red Wine is Good For Me. Right? Let's get something out in the open right up front. Wine contains alcohol. Alcohol is toxic to your body and is addictive. Clinically addictive, that is. Alcohol inhibits our inhibitions, and most of us can tell a tale or two about some of the bad decisions that were made while under the influence. Alcohol interferes with blood glucose control, even in non-diabetic people, and especially so when combined with a sugary mix. Alcohol has nearly twice as many calories per gram than sugar, and they are just as empty as sugar calories. Alcohol is very neurotoxic, even in modest amounts. Ever wonder why you stumble and slur your words after a few drinks? It's because nerve tissue and neurons (cells that process and transmit signals in your brain) are being disrupted and killed. That something is a compound called resveratrol, and it comes from the skin of red grapes. The studies on resveratrol were done on mice, and those mice were given very high doses. On average, one ounce of red wine contains 160 mcg. of resveratrol. In order for you to get the same doses that were shown to be (reportedly) beneficial to the mice, you would have to drink more than 60 litres (80 bottles) of wine PER DAY. In January 2012, a researcher who was working on the health benefits of resveratrol was found to have fabricated or manipulated data in 145 unique research projects. Wow. That's not to say that you should never have a glass of merlot with a nice prime rib dinner, just don't delude yourself into believing that you are doing your health a favour by doing so. Resveratrol: Kahn, Amina. "Resveratrol researcher faked data, report says; what drives academic fraud?" articles.latimes.com, Los Angeles Times, January 12. 2012. Web. Viewed November 2, 2012. 60 liters: "Red wine and resveratrol: Good for your heart?" mayoclinic.com, The Mayo Clinic. March 4, 2011. Web. Here is a great write up, complete withy some great research that talks about what modern hunter-gatherer tribes eat (and don't eat). It was written by Dr. Colin Champ, otherwise known as "The Caveman Doctor". We Can't Replicate Foods From The Paleo Era, So Why Bother? OK. True. Chicken and broccoli as we know it did not likely exist in the Palaeolithic era. This is not at all what we're going for. We know that we can't replicate the exact foods that Paleo man would have eaten. Some are extinct, and the ones that still exist have been altered and changed to be bigger, faster growing, sweeter, insect resistant, etc. We have to make due with what is available to us in the modern era. So, that means that we can eat the TYPES of foods that we know existed in the Paleo era and are biologically appropriate... meats, poultry, fish, seafood, fruit, vegetables, seeds and nuts. Heck, you can even eat insects if you like; in fact, many people around the world do eat them. They are probably quite Paleo and still quite unaltered. We do know this for sure. Pizza Pops, Nutella, Mac & Cheese dinner, hot dogs, Pillsbury™anything, Coca Cola, breakfast cereal and most other things that masquerade as food these days FOR SURE did not exist in the Paleo era; these items didn't even exist as little 150 years ago. Does this sound like a healthy, biologically appropriate diet for anything or anybody? Oh, and yes... we're aware that computers and the Internet didn't exist then either. Yes, on occasion someone comes up with this as an argument. The Paleo and ancestral diets do encourage the use of natural fats, such as saturated and monounsaturated fats from eggs, animal fats, coconuts, fish, seafood, nuts, seeds, olives and avocados. At the same time, ancestral diets discourages oils that are high in Ω6's, and this includes oils that have been extracted from such things as soy and canola. See our page on fats for more information. "According to a new study in the prestigious Journal of Clinical Nutrition in which researchers examined data from 21 different studies from across the world involving over 350,000 subjects, there isn’t a shred of evidence that saturated fat is associated with an increase in the risk of either coronary heart disease (CHD) or cardiovascular disease (CVD)." Here is a link to that study. Patty W Siri-Tarino, Qi Sun, Frank B Hu, and Ronald M Krauss. Fat, carbohydrate, and cardiovascular disease. Am J Clin Nutr March 2010 vol. 91 no. 3 502-509. There is plenty more research like this. It is tough to wrap your head around as we have been told by everybody that fat is bad (especially saturated fat) and we need to reduce or even completely remove it from our diet. But, if that is so, then why is it that we are all eating low fat grains, zero fat yogurt, skim milk and chicken breasts AND still getting fatter and sicker? Why are rates of cancer and heart disease rising, despite millions of dollars being raised to 'find a cure' every year? So many people are depressed, or have ADHD or some other similar disorder. Migraines, rheumatoid arthritis and fibromyalgia are becoming commonplace ailments in people who are barely middle aged and younger. Diabetes has been described as "pandemic" in some countries of the world.